There is a tremendous controversy these days about the no-go zones in France. Fox News has apologized for covering them. Fox Report host Julie Banderas said: “To be clear, there is no formal designation of these zones in either country and no credible information to support the assertion there are specific areas in these countries that exclude individuals based solely on their religion.” Yet while it may be true that there aren’t specific areas of France where non-Muslims are prevented from entering, there are many that, if they do enter, they must conform to Islamic norms. There is abundant evidence that there really are no-go zones, despite all the denial. See this video, and more: here is a video about how Muslims plotted to ambush Swedish police with firebombs. Another video shows riots that followed police trying to make an arrest in a Belgian Muslim suburb. Here is video of Muslim riots in Trappes, France. And here is a video showing the plight of the remaining French women in a Muslim-dominated area of France. 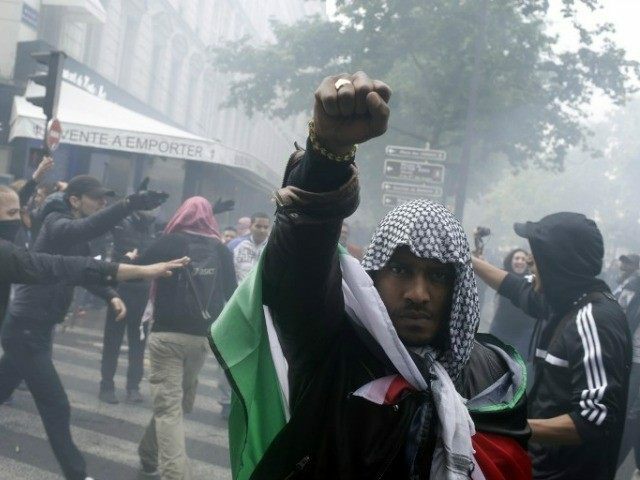 Here is a video showing Muslim youths running amok in Paris. In Paris, Muslims firebombed a bus with fifty passengers inside, and Muslim riots are spiraling out of control in Sweden. In Paris you have areas where a large majority of the population is Muslim (Aubervillers where my in-laws are from, La Courneuve, Stain, etc.). These places are infested with drugs and Islamists, because unlike the USA, France’s Muslim community is the largest majority in prisons (over 70%). They go to prison as drug dealers and come out as Islamist drug dealers. and this is largely how they finance terrorist operations. I have a very vivid souvenir of one night. My friend lives in one of the most dangerous places in France (La cite des 4000, in La Courneuve ). I was about fifteen years old, and needed to go to his house to study for a test. Upon my arrival, ten Muslims were at his apartment door and would not let me enter, saying that they did not know me, and wouldn’t let me in. I was shocked at the idea that in France there would be any place where I was not able to walk freely – it was insane! I had to call my friend, who came down from his apartment and begged them to let me in. And this is how it goes in these no-go zones. These Islamist gangsters steal, deal drugs, harass women who are not dressed properly, burn cars, and drink, and if you live there and ever complain, you will take a huge beating! I have a friend whose sister was raped in an elevator. The family wanted to go to the police, but the thugs who raped her sister caught her brother and burned cigarettes on his tongue. They warned him that if he ever talked. they would all be finished. Girls get raped and burned in garbage cans in these places. Ilan Halimi was held captive for weeks in places like these. There are no rules there, especially not for Jews. A Jew in these areas can take a beating at any time! The police do not go in unless they come with huge backup. If a police car gets lost there, it will get smashed to pieces! They provoke fires, so that the firemen come and get stoned! But I can tell you that living in these places is no picnic, and all these fake politicians can go live there and see if they can hold on for 10 minutes. That is true. Paris Mayor Anne Hidalgo and other politicians who have claimed that there are no Sharia no-go zones should walk through some of the areas that are widely identified as such, and see how long they last if they are women with heads uncovered. The mainstream media is once again failing the American people.